Young Tony decides to return to his hometown. There, he discovers his father has returned to France claiming to miss his friends and country of origin. Tony ends up becoming a teacher, and finds himself amid conflicts and inexperience. Marked by losses and mismatches, José's eccentric family seek to be happy while locked in Paraíso Perdido, a nightclub that has stopped in time, where they sing popular romantic music. A journey to the dark cutting edge of desires, lies and wickedness of a love triangle, from the moment a child is mysteriously kidnapped. Clara, a lonely nurse from the outskirts of São Paulo, is hired by mysterious and wealthy Ana as the nanny for her unborn child. The two women develop a strong bond, but a fateful night changes their plans. A young physician coordinating the transfer of patients between state-run hospitals in the city of Rio de Janeiro struggles with a mystery: a patient goes missing one night and completely disappears from the system. As the doctor attempts to find out the truth, he slowly loses his sense of reality. In Rio de Janeiro, Dr. João (Rafael Cardoso) is happily married with the teacher Leila (Leandra Leal), who is pregnant, and has a bureaucratic work. João is assigned to secretly transfer the patients from an old hospital that is administrated by his friend Dr. Heitor (Jonas Bloch) and will be closedown permanently by the governor. João meets his former schoolmate Dr. Olivia (Cláudia Abreu) in the hospital and stumbles upon a girl in a bed that he promises to give assistance and treatment. After the troubled transference of the patients to another hospital, João looks for the girl but does not find her. He becomes obsessed to discover what happened to the girl and makes a tragic discovery. 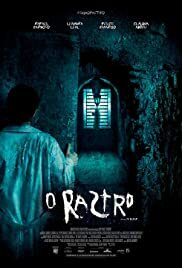 "O Rastro" is an uneven supernatural Brazilian film that could have been better and better. The cinematography and art direction are excellent, using the location of an old wing of the bankrupted hospital Beneficência Portuguesa in creepy scenes. The cast is also great, with top-notch Brazilian actresses and actors. The storyline is reasonable and could have used ambiguity when João becomes obsessed to find the girl. Unfortunately the sound is awful and there is no subtitle to understand many inaudible dialogues. But the worst is the messy screenplay that entwines politics with supernatural and horror and never works. The poor development of unpleasant characters is also a weak point. In the end, "O Rastro" is a movie with great potential but absolutely forgettable. My vote is five.